PuzzleNation Product Review: Give Me the Brain! In today’s product review, we look at a game that’s all about using your smarts to get the job done…before someone snatches them away from you. Welcome to Friedey’s, the fast food restaurant run by zombies. Every zombie has several jobs to do. Some of them are easy, but others are tougher and require a limited resource: the one brain shared by every employee. Only one player can use the brain at a time, so use it wisely before another player steals it! Give Me the Brain! starts with a very simple premise: empty your hand of cards before your opponents do. But behind that easy-to-follow mechanic lies a game fueled by luck and strategy alike. There are bid cards (blue) and job cards (yellow and pink). 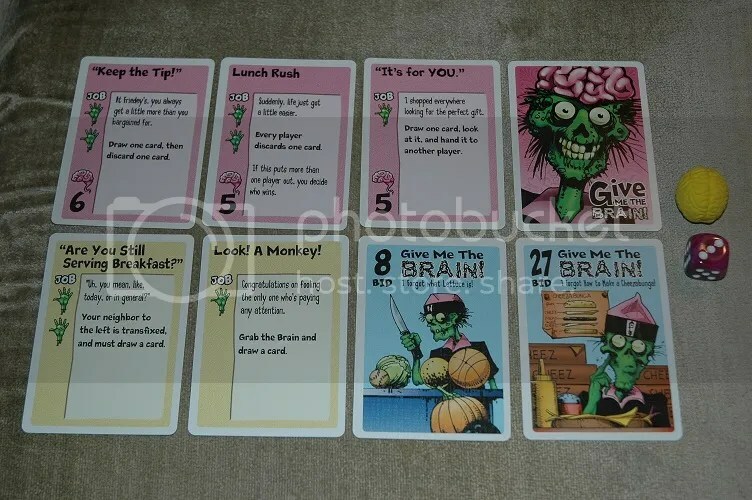 The bid cards are used to try to gain control of the brain, either by stealing it from an opponent or by taking advantage when another player drops it. The job cards come in two varieties, pink ones that require the brain and yellow ones that don’t. Since, as a zombie, you’ve got two hands (literal hands, not hand like “a grouping of cards”), you can either use two one-handed job cards or one two-handed job card per turn. For jobs that require the brain, you need to roll the die and beat the number on the job card. If you roll higher than the number on the card, you drop that card and keep the brain. If you roll lower, you drop the brain and other players can try to grab it. 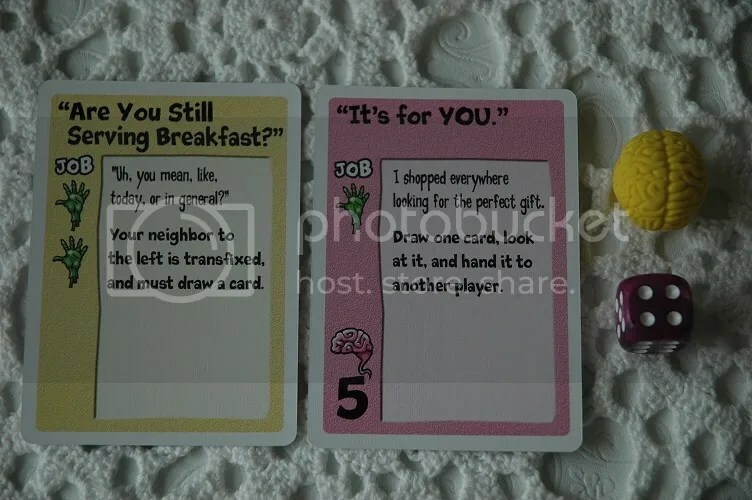 Between the different effects the job cards have and the requirements for playing them (one hand or two, needing the brain or not), this quickly becomes a game about maximizing opportunities. The game comes with the deck of cards and a six-sided die (which also represents “the brain” in play), but you can add a little brain to your set for less than a dollar extra, and I’ve found that passing the brain around the table is much more satisfying than stealing the die from an opponent. The premise is silly, the artwork is appropriately ghoulish, and the game play is topnotch, offering plenty of replay value. Picking this one up is a no-brainer. Give Me the Brain! is available from Cheapass Games for $25 and is featured in our Holiday Puzzly Gift Guide! This entry was posted in Games, PuzzleNation, Puzzles and tagged brains, card game, Cheapass Games, games, Geeking Out, Give Me the Brain, Holiday Gift Guide, Pop culture, PuzzleNation, Puzzlin' fool, zombie by gmdirect. Bookmark the permalink.